After skiing up and down Mount Baker yesterday, I wasn't sure if I'd have the energy to ski anything today. I went to bed exhausted, but set the alarm for 5:30am just in case. Buzzzzzz!!! Thankfully, I woke up. And with it being the last sunny day in the current weather window, coupled with a forecast for a week of clouds and rain starting tomorrow, there was enough motivation to drag myself out of bed and eventually out the door and on the road to Paradise. Skinned up just after 10am and was soon passing dozens, then hundreds, of other skiers, boarders, snowshoers, hikers, and climbers, all heading up for the free unlimited beer on tap at Camp Muir (or was it something else?). 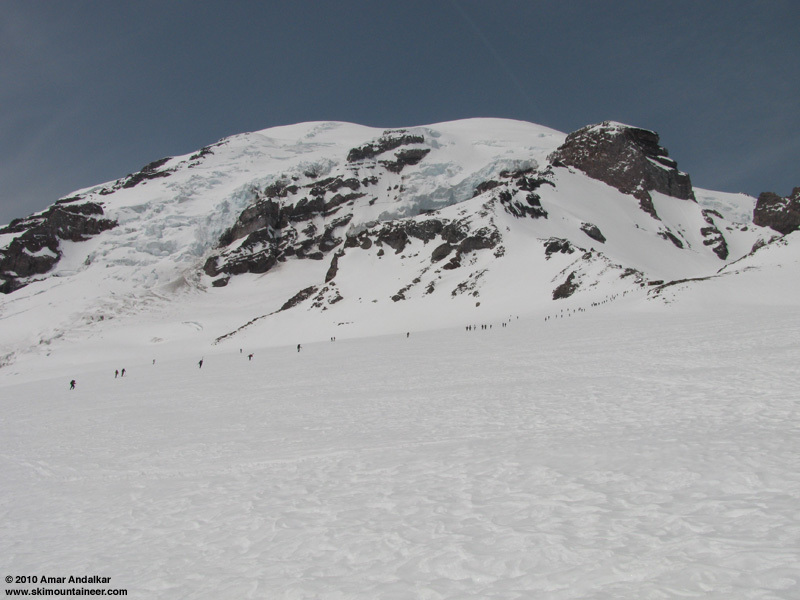 One of the busiest days I've ever seen on the Muir Snowfield, perhaps 300-400 people or more. Followed a skin track up the Snowfield well left of the conga line to enjoy some relative peace and quiet for a while, then upon arrival at Camp Muir at 12:45pm, avoided the crowds and headed to the climbing ranger hut to chat about route conditions with Philippe and Rachel, who are staffing the hut through Monday. The corn was already ripe below 9K while skinning up, but the last part to 10K needed a bit more time to soften. High cirrus clouds and a moderate SW breeze were delaying the ripening process today, but the dense cirrus produced a brilliant circular 22-degree solar halo most of the day, along with the oval-shaped circumscribed halo and even a section of the much rarer and fainter 46-degree halo (or possibly an infralateral arc) for a short time around 1pm (solar noon). 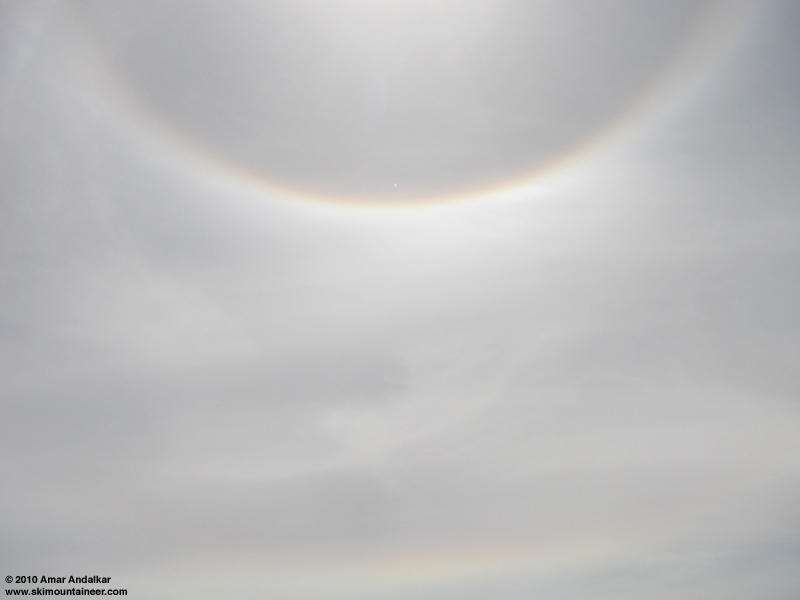 Solar halos: partial view of the full-circle 22-degree halo and oval circumscribed halo, with a section of the 46-degree halo or infralateral arc below. Skied down at 1:30pm, taking the skier's left (eastern) edge of the Snowfield to the steep slope beside Anvil Rock and onto the Paradise Glacier. Still not quite ripe above 9500 ft, but nice corn below, and even perhaps over-softened on the SE aspect of the Paradise Glacier. So I cut back onto the Muir Cornfield near 8600 ft, and was rewarded with superb corn and firnspiegel all the way down through the uppermost Pebble Creek roll at 7300 ft, super fast and super sweet. First run, 1:30pm, corn snow and conga line. The snow was nice enough that despite my exhaustion, I felt compelled to ski another run, so I slapped on the skins and headed up again. Much slower and more painful this time, taking 2 long hours to regain Camp Muir by 3:45pm. By this time, the crowds had thinned, indeed almost vanished, and the place looked deserted in comparison to the party scene of earlier hours. 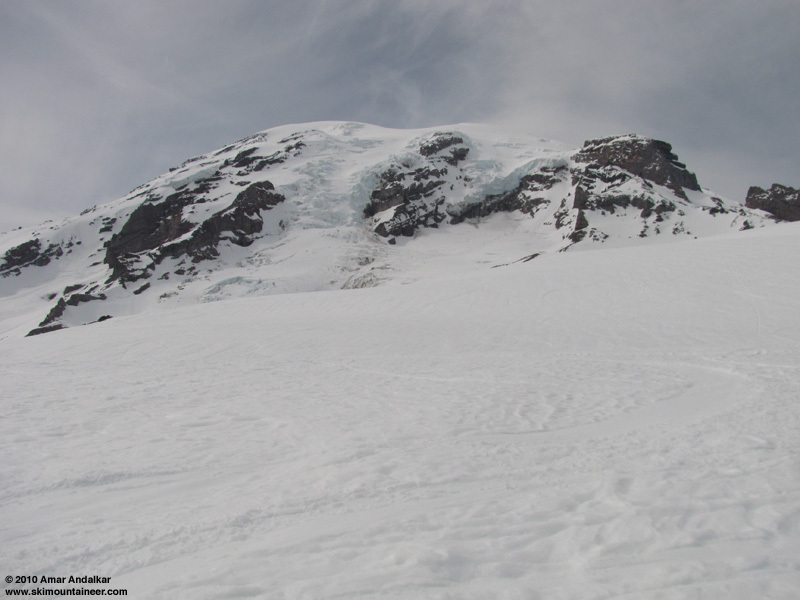 By now, the only large areas of untracked snow left on the entire Snowfield were to far skier's right, near the Nisqually Glacier, so that's where I headed for the second run at 4pm. Almost too late, as the uppermost few hundred feet had begun to crust over as the sun's angle and power waned. Luckily I was just in time, the incipient crust was still nicely skiable, and below 9700 ft it was absent entirely, with just beautiful ripper corn. Totally untracked west of the previous tracks, down to where you need to angle left to stay on the Snowfield and not accidentally stray onto the Nisqually Glacier. Another great run down to 7300 ft, then getting slower and stickier below that, and very mushy on Pan Face, but still fairly stable on that SW aspect and not sluffing in any large quantity as I skied. Second run, 4pm, still corn, no more crowd. Yet another great day in the mountains, with excellent snow conditions for most of the 7400 vert on the day, bringing the two-day total to 15100 vertical feet including Baker, the most I've ever done on consecutive days. And over 10000 vertical feet of that was sweet sun-ripened corn, generally above 6000 ft elevation on Baker and 7000 ft on Rainier. Too bad the incoming week of inclement weather is likely to severely disrupt this corn cycle just as it was getting good. Hopefully the sunshine and corn will be back soon. SYNOPSIS...A WEAK UPPER LEVEL RIDGE WILL MOVE ACROSS WESTERN WASHINGTON TODAY...PRODUCING MOSTLY SUNNY AND WARM WEATHER. ON SUNDAY...A DEEPENING UPPER LEVEL TROUGH JUST OFFSHORE WILL GENERATE SOUTH FLOW ALOFT...BRINGING A CHANCE OF AFTERNOON AND EVENING SHOWERS AND POSSIBLY A FEW CASCADE THUNDERSTORMS. SHOWERY WEATHER WILL CONTINUE MONDAY AND TUESDAY AS THE UPPER LEVEL TROUGH MOVES SLOWLY ACROSS THE AREA. A WEAK COLD FRONT FOLLOWED BY A LARGE UPPER LEVEL TROUGH WEDNESDAY THROUGH FRIDAY...WILL BRING COOLER TEMPERATURES AND A CHANCE OF SHOWERS. SATURDAY...MOSTLY SUNNY. FREEZING LEVEL 9500 FEET. SATURDAY NIGHT...MOSTLY CLOUDY. FREEZING LEVEL 10000 FEET. SUNDAY...MOSTLY CLOUDY. A CHANCE OF SHOWERS IN THE MORNING... THEN SCATTERED SHOWERS AND A CHANCE OF THUNDERSTORMS IN THE AFTERNOON. SNOW LEVEL 9000 FEET. SUNDAY NIGHT...MOSTLY CLOUDY. SCATTERED SHOWERS AND A CHANCE OF THUNDERSTORMS IN THE EVENING...THEN A CHANCE OF SHOWERS AFTER MIDNIGHT. SNOW LEVEL 9000 FEET. MONDAY...SHOWERS LIKELY. SNOW LEVEL 8500 FEET. MONDAY NIGHT...SHOWERS LIKELY. SNOW LEVEL 8500 FEET. TUESDAY THROUGH THURSDAY...MOSTLY CLOUDY WITH A CHANCE OF SHOWERS. SNOW LEVEL 6500 FEET. THURSDAY NIGHT AND FRIDAY...MOSTLY CLOUDY WITH A CHANCE OF SHOWERS. SNOW LEVEL 6000 FEET. Sorry I missed you, I left the lot at 10, got to Muir at 12:45, skied to Pebble Creek, back up slowly to Moon Rocks, and out to the car at 3. I'm amazed we didn't see/recognize each other... Glad you had a fun week! So glad to hear that Philippe and Rachel are back again this year - I wish I'd dropped by the hut. The gang of four I was part of added to that hundreds of people. I was amazed by the line. I made it up at 2pm right behind some guy and HIS DOG! That was pretty funny. It was a little grey dog and didn't look so out of breath so I figured I had nothing to complain about as I had boots on and longer legs. We headed down and got to the base area about 4pm whereupon Happy Hour commenced. Pretty nice day for a trip. way to get after it Amar! Geez Amar, you're going crazy. thought i saw you skiing next to anvil... that was quite the conga line, too! my newbie comrades were incredulous that there might be over 100 people up there, but by noon, my prediction proved quite the understatement! as far as free beer, there actually was a guy named Mike and his friends handing out free Rainier's at Muir... never seen so many people drinking beer up there. way to be a glutton for the vert! quite envious! You are a masochistic exhibitionist. And we are all better off for it! Not so sure I agree with that.� I enjoy the skiing and the sunshine and the feeling of just being up high in the mountains, but not the pain or suffering.� Not at all.� Some others certainly do relish that, but for me it's just the price to be paid (sometimes) to find and experience all the good things that I do take pleasure in. You're the best Amar! Rock on tough guy! Way to get after it!